For those of us lucky to live in a part of the country where October’s burst of foliage color is most intense, it is hard to resist the urge to photograph the 2 or 3 week parade of orange, yellow, and red hues. There is always a compelling image just around the bend. When is the best time for “leaf peeping”? Red Maples and Sugar Maples that show off the most brilliant reds and intense yellows. The tall white church steeples of classic New England villages, help punctuate and isolate the changing colors. In the hilly or mountainous terrain of the region the highest elevations have the earliest color, while the valley levels below are still green. Our Rocky Mountain friends would argue that the hillsides of bright yellow Aspen leaves set against deep blue skies of the Teton or Wind River Ranges are equally impressive. The first color shows up in Northern Maine and the Adirondacks in late September, with the fully developed trees making their statement during the first week of October. Peak color hits The New York/New Jersey area in mid to late October, and even later in the Smokies. It seems that global warming has delayed foliage time by as much as a week in some regions. If you have the time, plan a 2 or 3 week trip following the progression of peak color South. 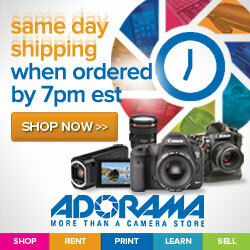 You’ll return home with a large portfolio of colorful images. 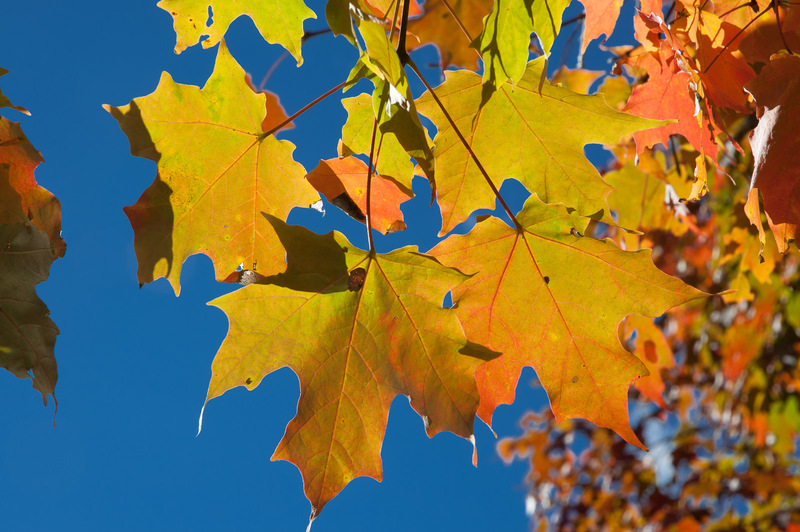 Beware the websites that offer what appear to be authoritative reports on fall color. I’ve found very few that are accurate. If you are not blessed with dry, sunny days do not despair; a hazy or cloudy day has its merits. Shooting in the woods on a sunny day is often a prescription for blown out highlights and noisey shadows. Instead, find middle distance forest scenics or closeup shots of leaves, water, and bright berries that benefit from the soft light of a cloudy day. Use a tripod as often as you can and take care to select shutter speeds that won’t blur the windblown leaves and ferns in your composition. You may prefer to use a polarizing filter to darken the blue sky, reduce reflections and increase contrast. But if the light is variable you may find yourself wanting to remove that filter to regain a stop and a half every time the sun is blocked by a cloud. colors alone do not make good photographs. Put buildings, people, tree trunks, boulders and water in your compositions. Use foreground and middle ground objects to build perspective into your images. If the landscape is flat, exploit the two dimensional quality by using a long lens to isolate objects and patterns. 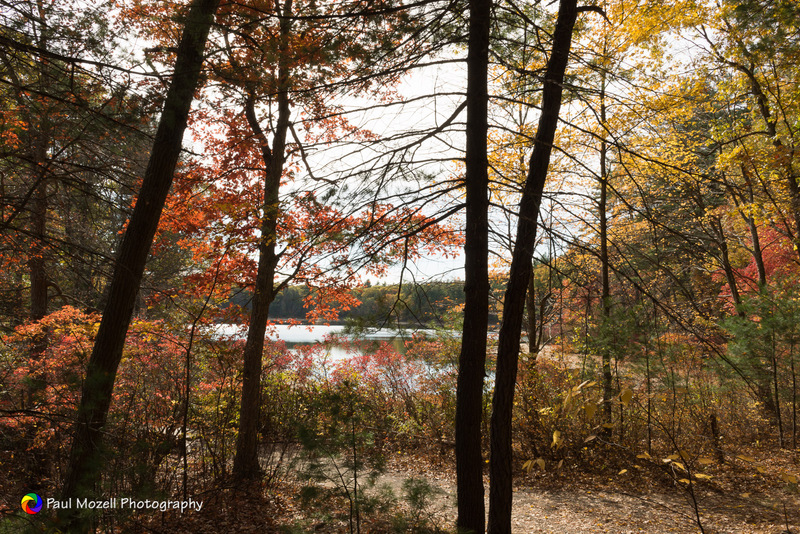 Grey Birches (the species with the smooth white bark) will often be the defining element of a fall photograph. Use still green trees to counter the brighter colors of nearby trees. And always, always, look for reflections in still or moving bodies of water. 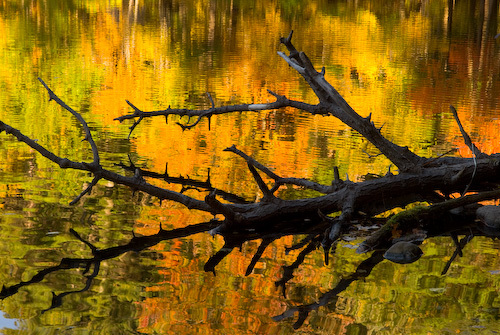 As the most colorful season draws to a close, photographic opportunities remain. 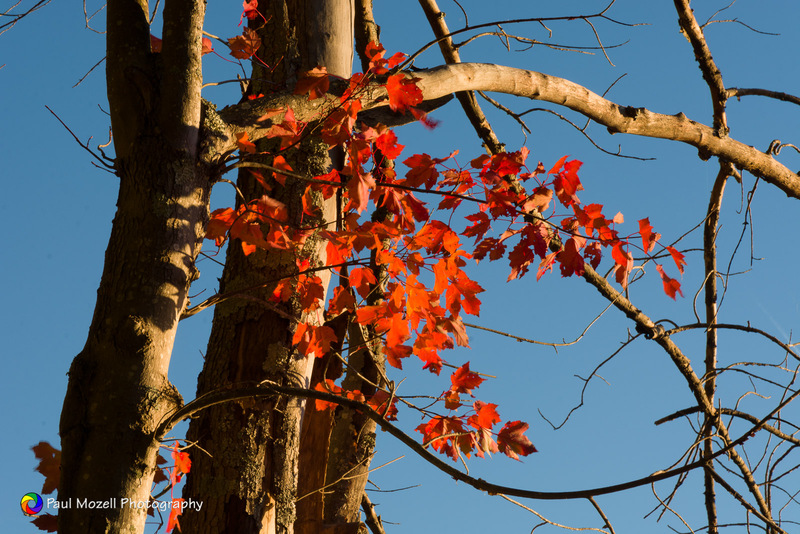 The oaks whose colors are not as rich as those of the maple, remain on their branches after most of the beech, birch, and hickory leaves have fallen. Bright berries remain, and the shrub plants of Viburnam, Fireweed, Virginia Creeper, and Blueberry may still be bright red as well. Golden brown branches, grasses and cattails are warmed by late afternoon sun. Once you get past the cliched photograph of the covered bridge over the perfect Vermont river, Autumn photography has many secrets to reveal. Thank you for sharing this information. I see a lot of tourist that just point their cameras at the scenery up here. So true on many points Paul. I’ve been searching for those great shots and yes I will play the tourist and shoot an awesome tree in color. But I know that to get a shot worth selling that I need the rest of the elements. The ever present forground element has to be there or having the subject framed in a wreath of leaves. You have to keep moving and look for all the compositional elements. Jeff Folger, Vistaphotography, Salem MA.